Please see the color corps training opportunity detail below. This is about as close to us as such training can be found. It is a chance to learn and become certified, or to enhance your skills. Please let me know if you will attend so I can pass on the word. Event: Color Corps and Color Corps Commanders Training. When: Saturday, 29 December–week from today. Location: The Bishop Ireton Center, 3300 Old Courthouse Road, North Chesterfield, VA 23236. Time: 9:00 AM – Noon. Dress: Attire for the training is casual (rubber soles shoes not recommended). 1) New Regalia: Bring only the beret, service baldric, sword, and gloves. 2) Legacy Regalia: Bring only the chapeau, service baldric, sword, and gloves. Please encourage your Sir Knights to complete the color corps training. Navigators and Commanders are strongly encouraged to attend both training sessions. If your assembly has extra gear, e.g., service baldrics, swords, etc., please consider bringing it. Coffee and donuts will be on hand. For planning purposes, please provide Faithful Navigator Carl Pendell (FN2205@vakofc.org or captp910@aol.com) or Faithful Commander Larry Floyd (rlf9242@yahoo.com) your attendee numbers by Friday, 28 December. Until we meet again… hopefully next Saturday. Note: For email security, all multi-recipients are sent in the BCC (Blind Courtesy Copy) address box. Addresses in the BCC are hidden from the world. 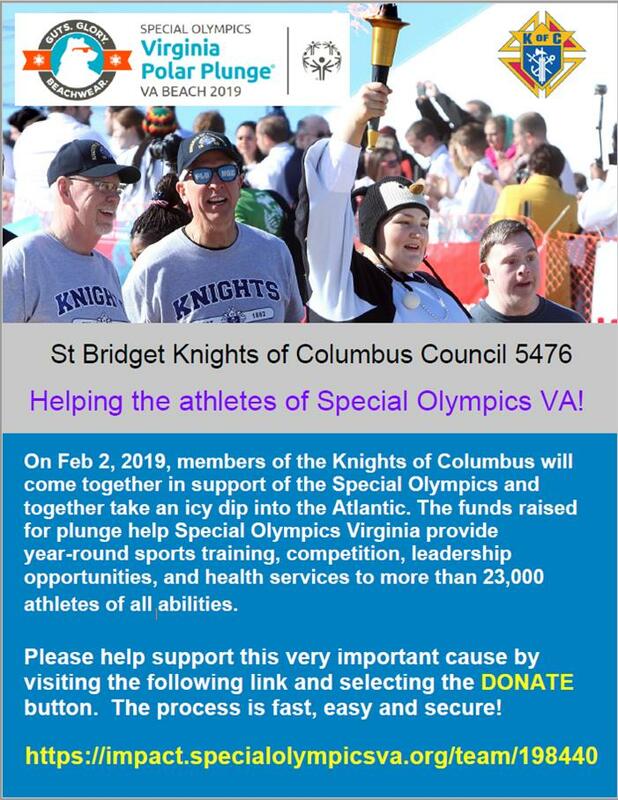 Help the Knights of Columbus and Council 5476 support the Special Olympics Virginia at the 2019 Polar Plunge by making a donation to their team page at the address below. The process is fast, easy and secure! Polar Plunge® is so much more than just an icy dip into the Atlantic. The funds raised for plunge help Special Olympics Virginia provide year-round sports training, competition, leadership opportunities, and health services to more than 23,000 athletes of all abilities. The Admissions and Formation Degrees scheduled for December 18, 2018, at Vietnamese Martyrs Council 14059 have been cancelled. I am requesting that they be removed from the State calendar. There will be an Admissions Degree on January 23, 2019, at 7:00 p.m., at St. Bridget Council 5476. There will be a Formation Degree scheduled in the District in February so that all Admissions and Formation candidates of our Councils will be qualified to attend the Knighthood Degree on March 18, 2019, at Bishop Ireton Council. It’s time to continue putting the list together for the March for Life on Friday, January 18, 2019. If I already have you signed up for 2019 no need to respond, but I did want to touch base with my mailing list from past years. This year we have the St. Edward’s bus stopping at the St. Bridget access road by the Middle School for pick-up at 8:30 a.m. as an additional option. You would need to be at St. Bridget no later than 8:15 a.m. to leave time to check in. To reserve a seat on that bus, please contact bus captain Tony H directly at tjhack@hotmail.com. If you would like spots reserved on the bus that departs from the Columbian Center we will follow the routine of past years as far as departure time, etc. ( meeting at 7:45 a.m. for an 8 a.m. departure from the Pump Rd. location, travel to the Pastoral Center to meet with the Southside bus, and depart DC at 4-4:30 p.m.). This year, instead of emailing me, contact Darius, the bus captain for the Columbian Center bus, directly at dmyaz@verizon.net . Darius, please let us know if you anticipate any substantive changes. When signing up, please provide a mobile phone number. Please pass this information along to friends, parish groups, etc. Please try to sign-up early, in the past we had a waiting list and had to scramble to get people on other buses. Also, a Respect Life Holy Hour has been scheduled for January 15, 2018, @ 6:30 p.m. at St. Bridget Church. The Holy Hour will be intended as a vigil of sorts for the March for Life and will include Exposition of the Blessed Sacrament and Benediction. Please make every effort to join the Church in prayer for the success of our pro-life efforts. Any questions, please let me know. Thanks and a Blessed Advent to you all. Novena: 9 Days for Life One of the simplest ways our parish can unite during Respect Life Month is joining in prayer. Praying a Novena is an extremely accessible, yet powerful way to pray for a specific intention. To participate in our parish-wide Novena for Life, all you need to do is pray the designated prayer once a day, for nine days in a row, starting January 14th, and ending January 22nd. It’s time to continue putting the list together for the March for Life on Friday, January 18, 2019. If I already have you signed up for 2019 no need to respond, but I did want to touch base with my mailing list from past years. This year we have the St. Edward’s bus stopping at the St. Bridget access road by the Middle School for pick-up at 8:30 a.m. as an additional option. You would need to be at St. Bridget no later than 8:15 a.m. to leave time to check in. To reserve a seat on that bus, please contact bus captain Tony Hackenburg directly at tjhack@hotmail.com. Please pass this information along to friends, parish groups, etc. Please try to sign-up early, in the past we had a waiting list and had to scramble to get people on other buses. The annual March For Life is scheduled for Friday, January 18, 2019, in Washington D.C.
We’ll have additional information about the event and how to participate at our upcoming Member Meeting (this Monday, December 10th). Below is the Sign Up Genius site to use to sign up to be a Marshall for the March for Life on January 18 in DC. Please pass it on to interested brothers in your Council. Thank you.